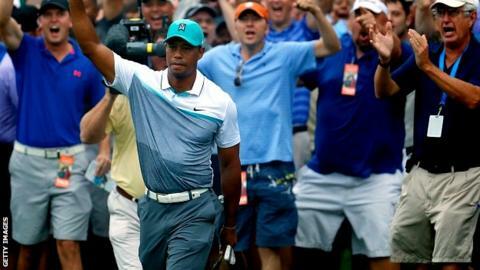 Former world number one Tiger Woods shot his lowest round for two years with a 64 at the Wyndham Championship in Sedgefield, USA. The 14-times major champion finished the first round two shots off the lead on six under par, a week after missing the cut at the US PGA Championship. Woods, 39, made seven birdies and one bogey and was happy with both his iron plan and his putting. "They were both solid today, it was nice," said Woods. "I was telling Joey (caddie Joe LaCava) it's finally nice to get something out of a round, a round that could have been two to four under par, it's finally six." Woods, who has missed the cut at his last three majors, shot his best round since the 2013 WGC Bridgestone, 749 days ago. Germany's Martin Kaymer also posted an opening 64 in North Carolina, with Americans Erik Compton and William McGirt the early leaders on eight under.